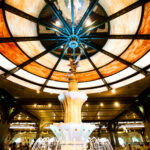 It’s time for another restaurant dinner tour! 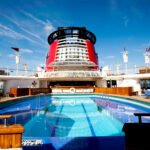 This time we’re headed back to Parrot Cay aboard the Disney Magic cruise ship. 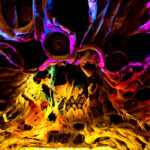 Several nights on board you are served a themed dinner, which gives you a chance to order off of a unique menu from a restaurant you may have already visited on a previous night. 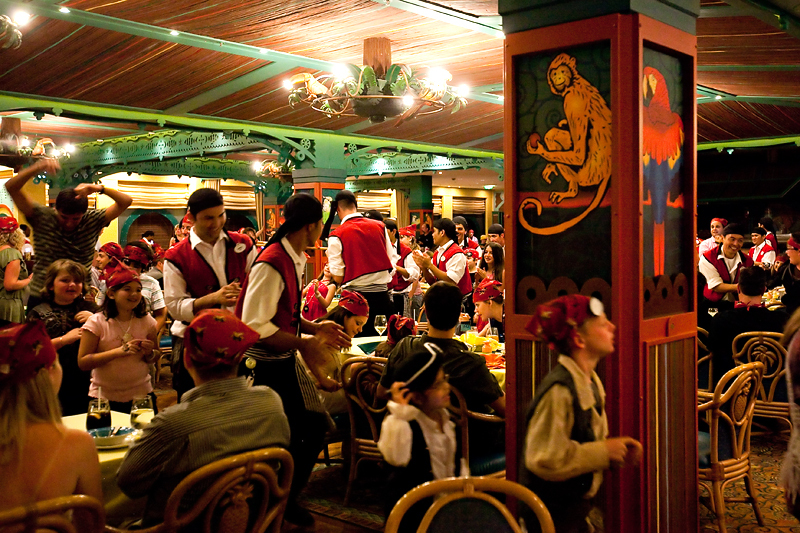 Pirate Night is a common theme found on all of the Disney ships. 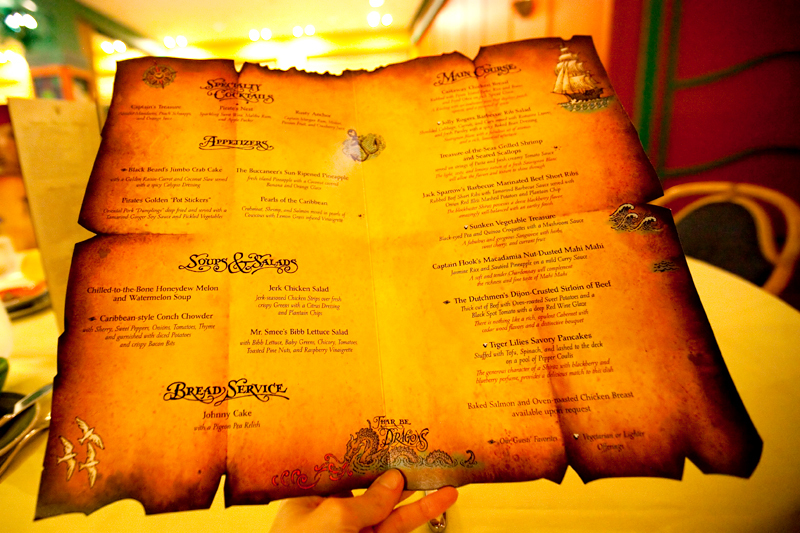 You are in the Carribean, after all..
We loved the cute treasure map menus! Pretty much everyone at our table started with the crab cake. 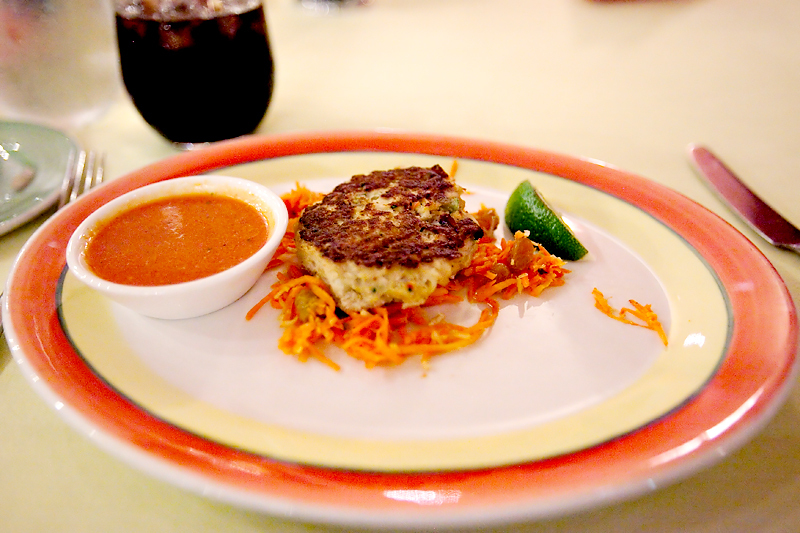 I’m of the opinion that it’s always a good idea to start a meal with a crab cake. 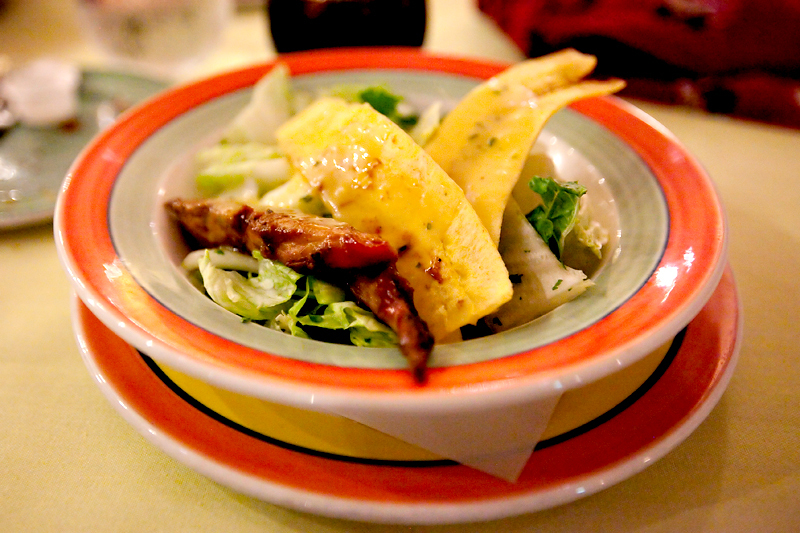 We followed that with a jerk chicken salad with plantain chips. It’s been a while since I’ve had anything seasoned with Jamaican jerk spice, which is primarily made up of allspice and Scotch bonnet peppers, and also includes cloves, scallions, nutmeg, cinnamon, thyme, garlic, and salt. 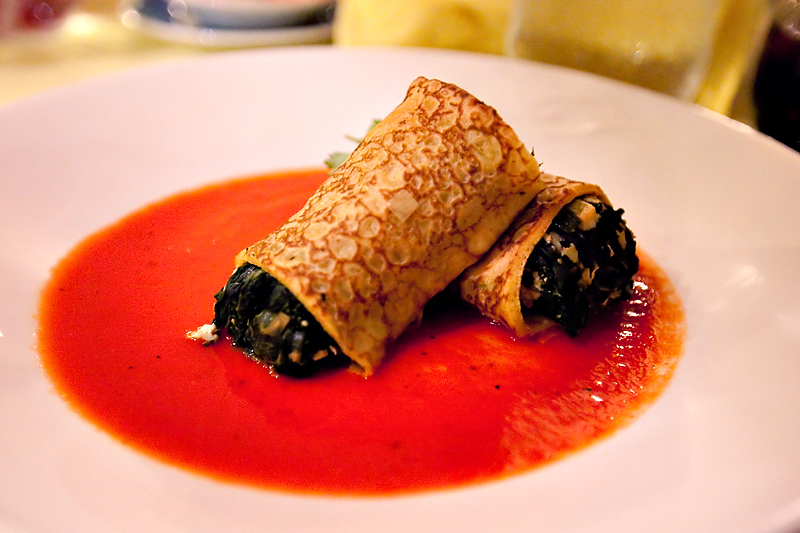 Our server recommended this dish for Matt’s main course – Tiger Lilie’s savory pancakes – stuffed with tofu, spinach, with pepper coulis. 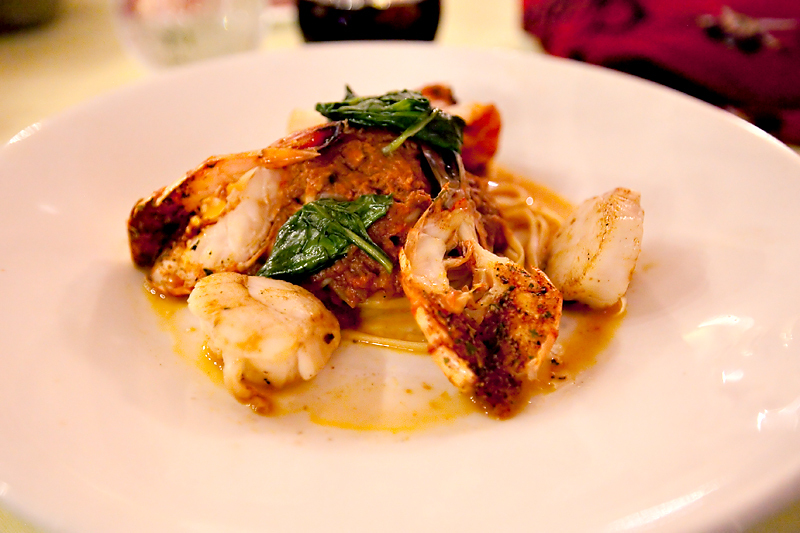 I chose treasure-of-the-seas grilled shrimp and seared scallops served with tomato sauce on a small bed of pasta. I could eat scallops every single day of my life. Seriously. I will never pass up a chance to order them! Typical of a dinner aboard a Disney cruise, there were a few shenanigans as the servers danced around with the kids while decked out in their pirate’s garb. This was my dessert, which I ordered because it just sounded so interesting. 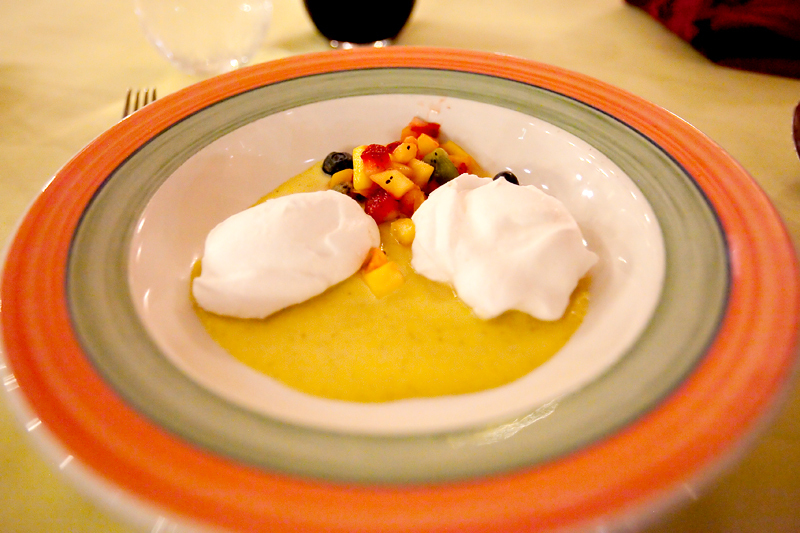 It was called the floating island of tropical fruit treasures – stiffened meringue with tropical fruits and berries swimming in a creamy vanilla sauce. Most nights there is some kind of sampler option on the dessert menu. 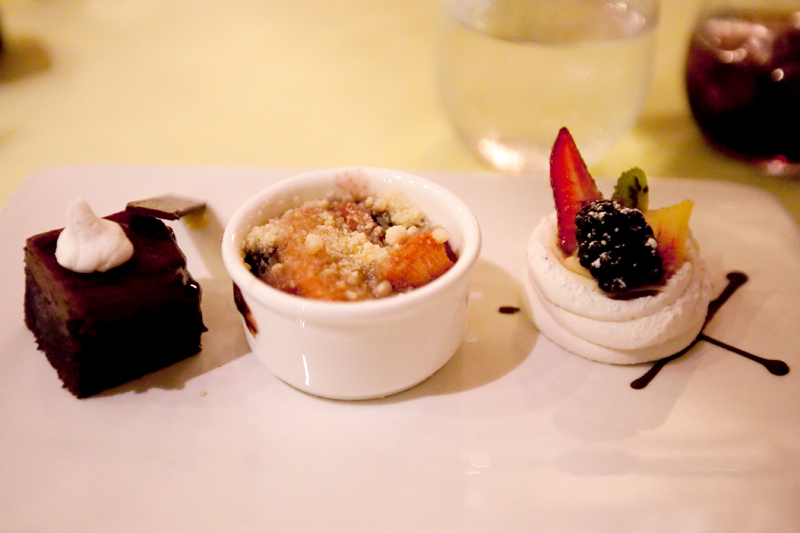 They bring you a trio of miniaturized desserts so you can sample several things. Matt couldn’t decide on a single dessert on Pirate Night, so that’s what he ordered. 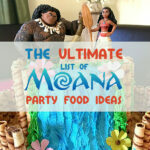 He was brought a sampling of triple-layer chocolate rum-soaked cake, floating island, and fruit cobbler. The various types of cobblers were by far the most delicious of the desserts in any of the restaurants on the ship. When in doubt, order the cobbler! My love for Jerk seasoning only tripled on our honeymoon. But uh…they are way more liberal with that stuff down there. And it’s way hotter. Also, scallops. Seconded. I never pass them up either!